Double-layer linens made from recycled cotton saris come in an array of traditional Indian patterns and colors. Finished with traditional kantha embroidery, and small hanging loops. Let us choose for you! Set of 3. Machine wash cold, line dry. 11 1/2" sq. We have a customer who purchased these as her luncheon napkins. They were exactly the size she was looking for and the fun color combinations would brighten up her table setting. 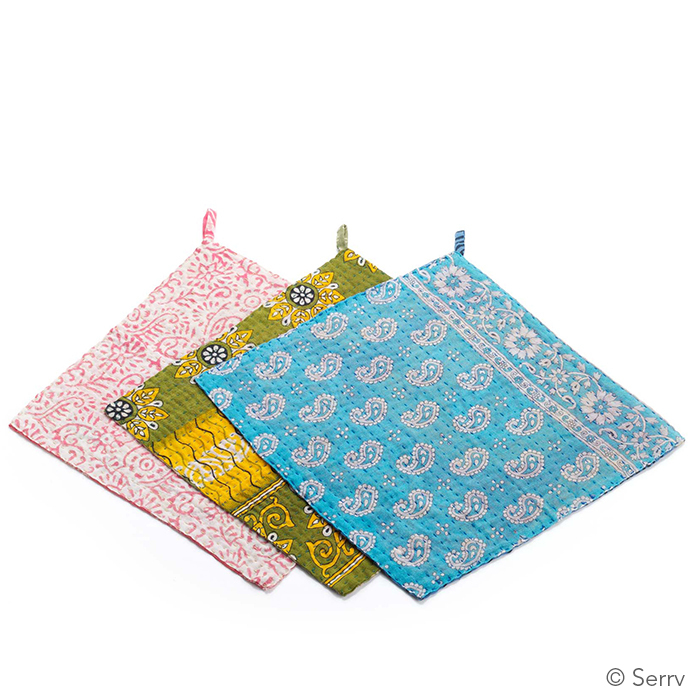 For years I have looked for Fair Trade dish cloths, so I was very excited to discover this product from Serrv. And when I received them I was even happier as they are beautifully made, work great and even hold up through the washer and dryer! I love the size and weight of these cloths made from recycled sari's. The colors are fun! I bought more to give as gifts. I bought these dish cloths to use as gifts in addition to keeping some for my own use. The one I am currently using has all the colors of my kitchen and is just the right weight to clean and wipe counters. I hate thick cloths and this is just to my liking! These will make a nice gift. I am giving them separately. 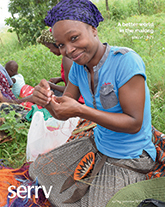 Reduce, reuse, recycle, and make it beautiful. 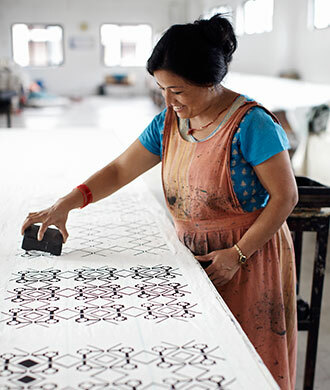 These cloths, which reuse cotton from saris, are stunningly beautiful. What a lovely way to care for creation. In the set I bought, each side is a different, attractive pattern. 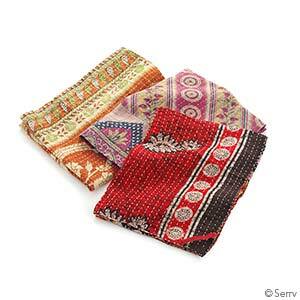 They can not only function as dish cloths, but as a model for your own out of style or outgrown cotton prints.